Carefully sited to preserve the conifer and mixed hardwood trees on a northern Michigan lakefront, this residence recalls traditional coastal summer homes and the indigenous agrarian traditions of the local farms and orchards. A prismatic copper roof sits above simple rectilinear volumes and a colonnaded summer porch. The interiors strike a balance between a Modernist conception of overlapping spaces, and rooms of more traditional spatial delineation. Materials, lighting and colors were selected to reinforce the connection to the natural setting with its long golden sunsets, and include red birch and copper slate floors, steamed European Beech wainscot and cabinetry, and green slate hearth and chair rails. The house was planned to provide optimal western views to the lake, and through the stand of red pines to the south. The dining and living rooms, kitchen, as well as three bedrooms share the exposure to these views over the water. The colonnaded porch wraps the south and west side, providing a sheltered outdoor space and recalling southern Gulf Coast porches of the owners’ early life. 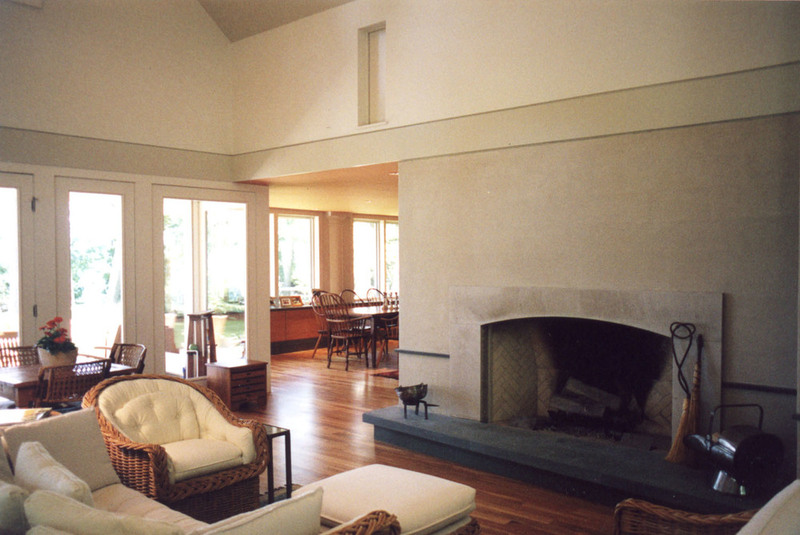 The large diameter columns merge with the exterior wall as pilasters at the dining and kitchen and then continue freestanding at the master bedroom porch. This merging suggests that the porch may have been originally continuous and that those spaces may have been an expansion of a smaller building, not uncommon in the evolution of summer cottages. As this structure replaced a small cottage on the site, the owners wished to maintain the sense of being light on the land while accommodating a large family. Hence, the building was set back from the waterfront to somewhat diminish its presence, and carefully organized to minimize overall size while maximizing internal volume. In addition to discrete bedrooms in the “eaves” of the hip roof, a large bunkroom and garage that converts to a screened sleeping porch enable family reunions of 16.